What is Occupational Thera py? Occupational therapy is based on repairing the impairments and limitations of meaningful activities of daily life such as, self-care skills and social interaction. What is commonly treated in Occupational Therapy? Why choose The PARC at Joliet for Occupational Therapy? 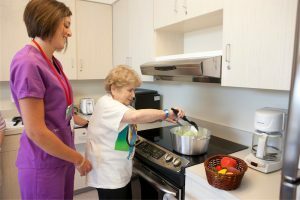 The ultimate goal of our Occupational Therapists is to help our patients gain and improve their basic motor, cognitive, and emotional abilities to either gain more independence in their day-to-day life or restore confidence and self-worth.